“Mr. Williams’ life still teaches me two things: Be kind and true in all dealings, and anyone can learn to succeed. "This Louisianan epitomizes the spirit of most Americans, hard working, persevering, and helping others. Anyone who takes the time to read this inspiring story can't help but profit from it, professionally and spiritually. It shows what a little perseverance and faith can do." 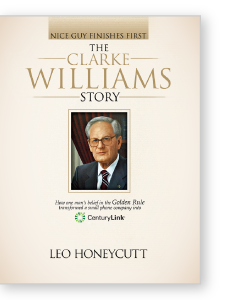 "Mr. WIlliams' priorities were consistent: God, family, and employees and customers of CenturyLink®. He was a shining example of a good father, the best employer and the fairest in business. This book shows how to build a great company and a great legacy."